Abolish devolution.For a united and unitary country. The anti-separatist group.United against nationalism. We in the United Kingdom Association believe that the interests of everbody in the UK are best served by retaining unity between the constituent parts of Britain.Consequently we propose to advance pro-unity arguments and present the positive case for a unitary UK. It is therefore obviously essential that we put the positive case for Scotland to vote 'no' in the upcoming referendum on independence. To this end,this Association will work with any group or person who supports the Union anywhere in the UK.We wish to create a common face against nationalism in all it's forms,wherever it's found. 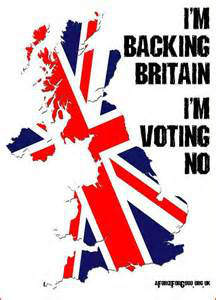 We strongly urge everyone to spend the remaing days of the campaign doing all they can to encourage people who are eligable to vote in the referendum to say 'no'.This is very important.For more information on the benfits to us all in the UK of Scotland staying in the Union,please go to the excellent Better Together website.You can also volunteer to make phone calls to voters in Scotland there as well.